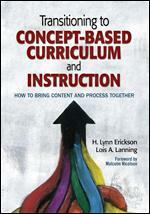 In their new book, Transitioning to Concept-Based Curriculum and Instruction authors Lynn Erickson and Lois Lanning outline the steps necessary to create and implement a concept-based curriculum. The first chapter outlines why traditional content objectives are problematic. This almost seems heretical considering how much emphasis standards documents and schools place on objectives. The problem with writing objectives this way is that they usually lead to specific activities rather than a focus on an idea to understand. We can easily see that the second example allows for the clearer transfer of an idea to new situations beyond the study of World War II. We also know that the first example too often leads to the teacher or text doing the analysis and the students simply remembering it. If given a new situation, students would have to prove that the second example is true by grounding it in factual evidence. 1) How much time have you and your school spent focused on traditional objectives? 2) What shifts in student learning might take place if the critical conceptual understandings (transferable ideas) were more clearly outlined in standards documents?